The English-Irish boyband – who are currently conquering the pop world while on a global press tour – are being sued by an American all-male band over the use of their name. BRITISH-BASED BOYBAND One Direction are heading in the direction of global fame, but they have hit a bump in the road – their name. They are being sued by an American all-male band of the same name, MTV reports, who are asking the former X Factor contenders to change their moniker to something else. The Californian band claim that they have had the name since 2009, says the Daily Mail, before the UK band members had even met on the set of the reality TV show, says The Guardian. The suit was filed in California central district court and says that the US band is entitled to profits made by the UK band as well as damages worth more than $1million. 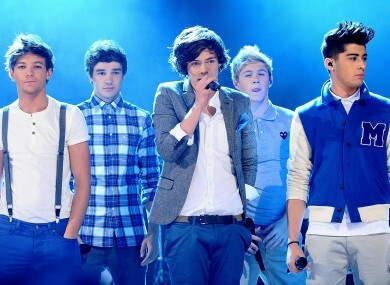 One Direction – Irish member Niall Horan and his UK bandmates Louis Tomlinson, Zayn Malik, Harry Styles and Liam Payne – have been busy touring the world promoting their album Up All Night, which went to number one on the Billboard 200. Their US debut was on the Today programme, where they performed live on TV at the Rockefeller Plaza – accompanied by hundreds of screaming fans, naturally. They are currently in Australia, where the Daily Mail reports they were greeted by… you guessed it, even more screaming fans. Email “One Direction are being sued by... One Direction ”. Feedback on “One Direction are being sued by... One Direction ”.